WASHINGTON, DC, December 20, 2011 (ENS) – Road and bridge improvements; transit upgrades; freight, port and rail expansions; and new options for bicyclists and pedestrians are receiving grant funding from the U.S. Department of Transportation months ahead of schedule says Transportation Secretary Ray LaHood, so that communities can advance job-creating infrastructure projects. Forty-six transportation projects in 33 states and Puerto Rico will receive a total of $511 million as part of the third round of the Department of Transportation’s popular TIGER grants program. The Department of Transportation received 848 project applications from all 50 states, Puerto Rico and Washington, DC, requesting a total of $14.29 billion, far exceeding the $511 million made available for grants under the TIGER III program. “The overwhelming demand for these grants clearly shows that communities across the country can’t afford to wait any longer for Congress to put Americans to work building the transportation projects that are critical to our economic future,” said LaHood. “That’s why we’ve taken action to get these grants out the door quickly, and that is why we will continue to ask Congress to make the targeted investments we need to create jobs, repair our nation’s transportation systems, better serve the traveling public and our nation’s businesses, factories and farms, and make sure our economy continues to grow,” he said. In November, President Barack Obama directed the Department of Transportation to expedite transportation projects by accelerating the process for review and approval and by leveraging private sector funding to promote growth and job creation. As part of that initiative, the agency accelerated the TIGER III application review process and has announced the awards months ahead of the planned spring 2012 announcement. TIGER grants are awarded to transportation projects that have a significant national or regional impact, says LaHood. Projects are chosen for their ability to contribute to the long-term economic competitiveness of the nation, improve the condition of existing transportation facilities and systems, increase energy efficiency and reduce greenhouse gas emissions, improve the safety of U.S. transportation facilities and enhance the quality of living and working environments of communities through increased transportation choices and connections. 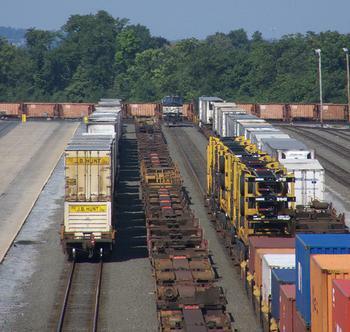 For instance, the Pennsylvania Department of Transportation was awarded $15 million, covering one-fourth of the funding needed to expand the Rutherford Intermodal Facility, enabling the facility to keep pace with growing freight traffic demand in the Harrisburg area. The project includes track work, expansion of parking access, and the construction of cranes to increase capacity. This facility is a central point for freight from cities in 12 states, including Chicago, Memphis, and Atlanta. The project will also reduce highway truck traffic along those corridors and increase the loaded trains expected to start or terminate in Harrisburg to 50 per day. Because freight transport by rail emits less greenhouse gases than truck transport of the same weight, this project is expected to reduce carbon dioxide emissions by 1.8 million tons and save 162 million gallons of fuel over 30 years. Of the $511 million under the TIGER III program, roughly 48 percent will go to road and bridge projects, including more than $64 million for Complete Streets projects that will spur small business growth and benefit motorists, bicyclists and pedestrians. More than $150 million will go to projects in rural areas, including three grants to tribal governments to create jobs and address transportation needs in Indian country. Nearly one-third of the funding will support transit projects such as the Westside Multimodal Transit Center in San Antonio, Texas. Twelve percent will help build port projects like the Port of New Orleans Rail Yard Improvements. Ten percent will go to freight rail projects like the Muldraugh Bridge Replacement in Kentucky. And three grants will provide better multimodal access to airports, including the Dallas-Fort Worth airport in Texas. Work has already begun on 33 planning projects while 58 capital projects are under way across the country from the previous two rounds of TIGER. An additional 13 projects are expected to break ground over the next six months. In 2009 and 2010, the Department received a total of 2,400 applications requesting $76 billion, greatly exceeding the $2.1 billion available in the TIGER I and TIGER II grant programs. In the previous two rounds, the TIGER program awarded grants to 126 freight, highway, transit, port and bicycle/pedestrian projects in all 50 states and the District of Columbia. LaHood says the continuing demand for TIGER grants shows the need for further investment in U.S. transportation infrastructure that could be provided by President Obama’s American Jobs Act, which was rejected by the Republican-dominated House of Representatives in October. The American Jobs Act would provide $50 billion to improve 150,000 miles of road, replace 4,000 miles of railway track, and restore 150 miles of airport runways for a safer, more efficient transportation network. It also would provide $10 billion for the creation of a bipartisan National Infrastructure bank. Click here for a complete list of grant recipients.